In the much talked about Masterclass series, Dan Tapiero, a man who has worked with some of the biggest legends in finance, joins us to talk about his career and the launch of Gold Bullion International. Well overdue, one of my favorites as well. 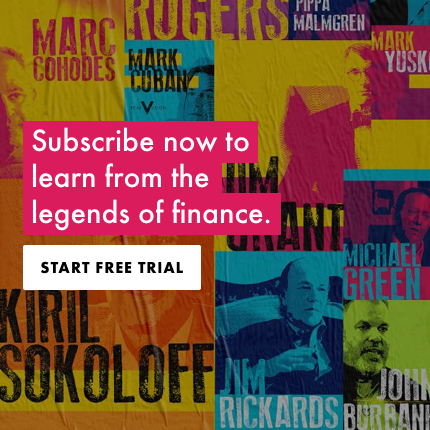 The most useful/relevant of the three master classes to date (Tapiero, Novogratz, Hart). Gold as an "emerging market wealth bet" - spot on ! Having done business with Hard Asset Alliance I must say they have made the retail purchase and storage/delivery of precious metals vary simple. Why is Dan not mentioned as Cofounder on the GBI website, when GBI CEO and GBI President are? Dan is part of the advisory board, simply referred in his Bio as a veteran global macro investor. His business is exactly what I have been looking for. Brilliant!